Statistics tell us that the average UK resident can currently expect to live for over 80 years. Bury that same UK resident (or any human for that matter) in an avalanche, and life expectancy drops to about 15-20 minutes! Because of this, the best hope for the winter mountaineer or skier caught in an avalanche is rescue by members of the same party, using transceivers (radio beacons), shovels and probes. In the UK few winter climbers carry that sort of kit. 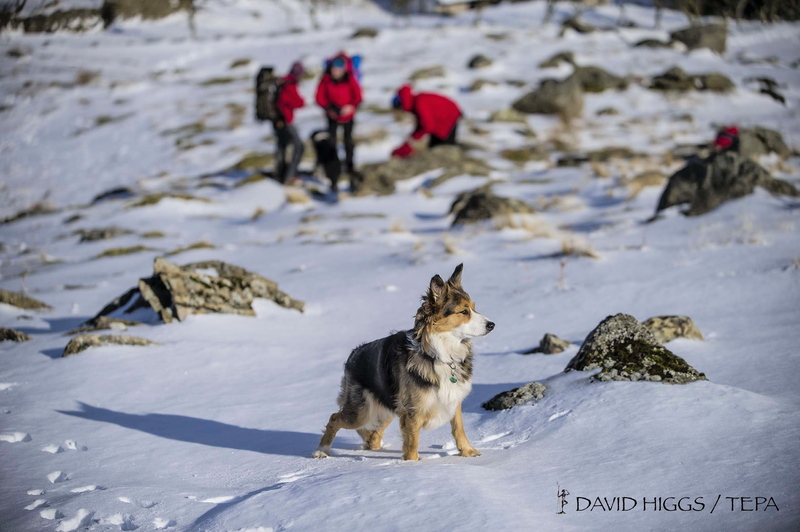 In that case there are two search alternatives – one involves a line of rescuers, almost shoulder to shoulder, probing the snow with rods, the second alternative is the air-scenting search dog. 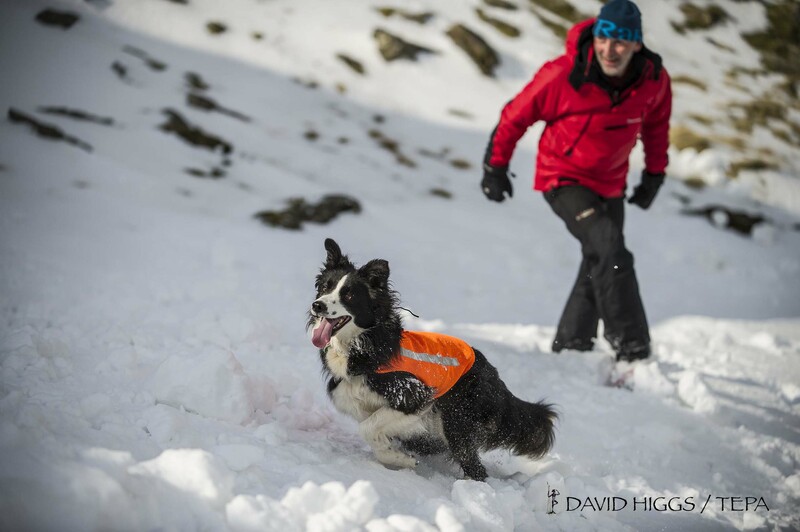 So, when the snow falls in the mountains of the UK, the various Search And Rescue Dog Associations (SARDA) take advantage of the conditions, and train to search for avalanche victims. There was a heavy dump of snow in North Wales on the first day of spring, on top of an existing snowpack. 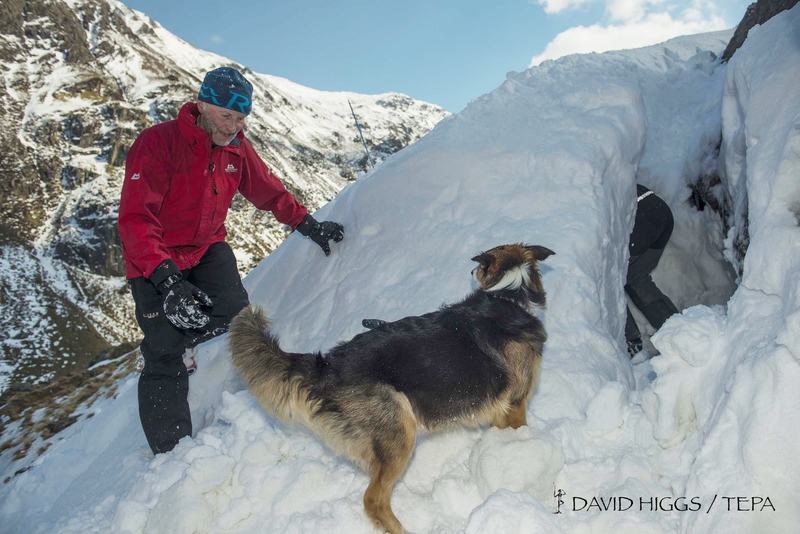 This gave ideal training conditions for searching for avalanche victims. 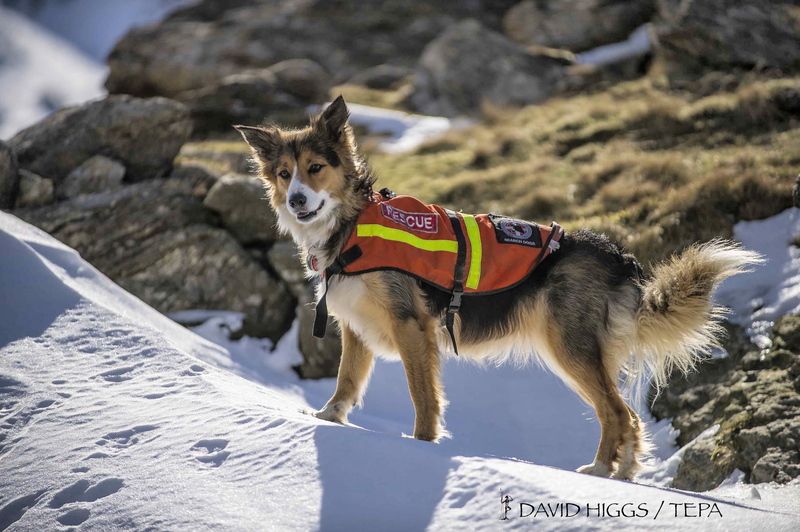 The stars of the show were search dog ‘Cluanie’ with handler Helen Howe, assisted by volunteer bodies Peter and Danny, all from Llanberis Mountain Rescue Team – also along for the ride was ace photographer David Higgs. 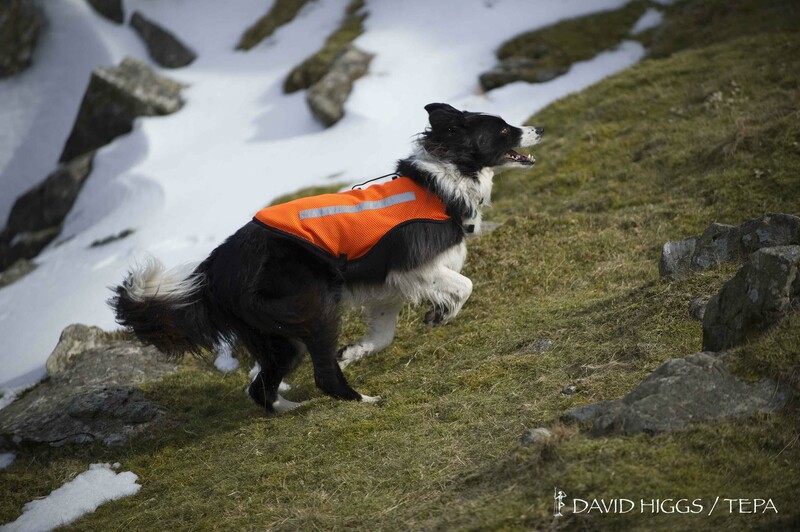 My Border Collie ‘Mist’ is at an early stage in search training, but also came along for the training experience. As well as the dog, I had brought another useful tool – a snow shovel! 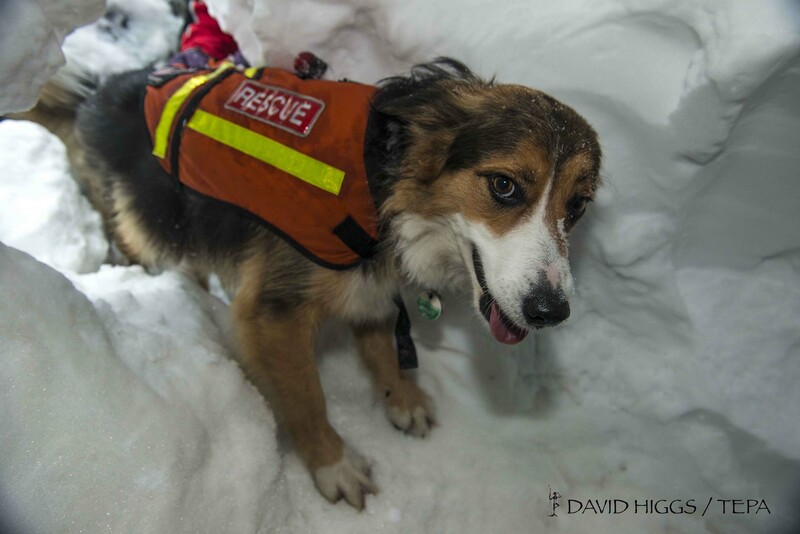 To practice searches on snow buried victims you first need a victim. The next requirement is a hole in the snow to simulate an avalanche burial, hence the snow shovel. Danny and I both laid into a snow bank on the slopes of the Llanberis Pass, producing a snow cave that could be blocked up to simulate an avalanche burial. After we had dug our snow hole, Helen completed a couple of searches with ‘Cluanie’, with Danny and David playing the role of victim. 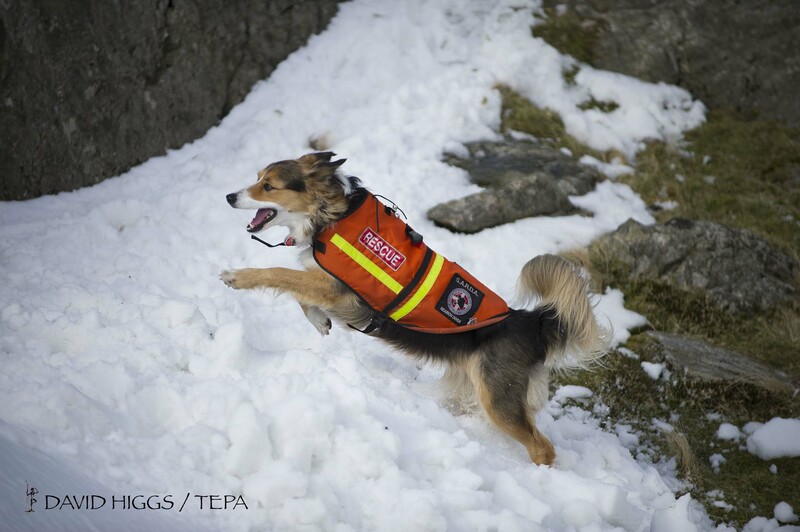 For a trained search dog like ‘Cluanie’ the job is pretty simple. Search for a human scent, follow it to the source, and in this case help the handler by doing a bit of digging – it really was as simple as that. After a master class by Helen and ‘Cluanie’ in searching for snow buried victims, it was time for ‘Mist’ to have a go. 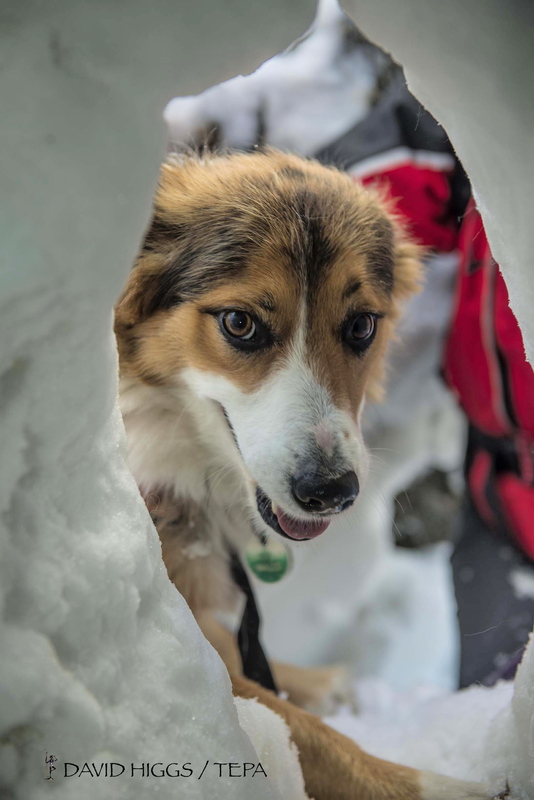 ‘Mist’ and I are at a very early stage in search training, and a complete burial scenario was too advanced for us – instead we completed some short run-outs, where the ‘body’ plays a game of ‘hide and seek’ for the trainee dog, including the snow cave as one of the hiding places. 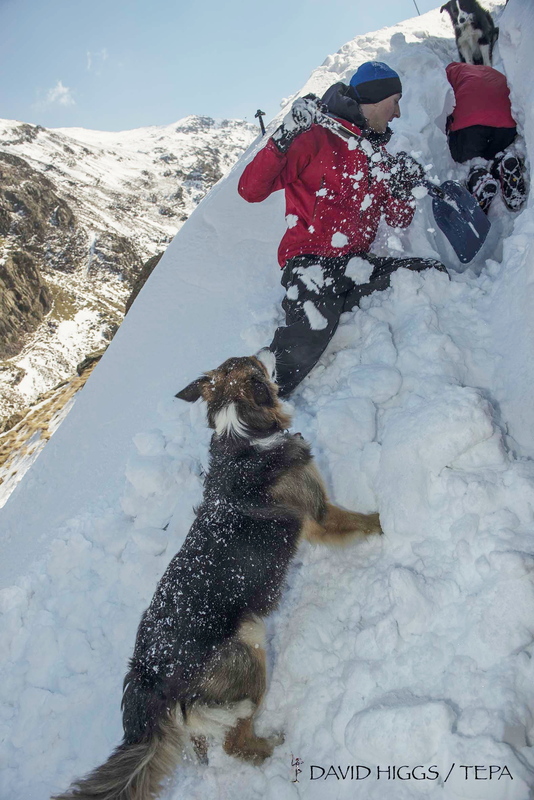 This last winter has seen several avalanche deaths in the mountains of the UK, and companion rescue (plus carrying the right gear) is always the best hope following a snow slide. A far better policy though is learning about avalanche avoidance before an accident strikes. Failing that, it’s down to the volunteers and search dogs to come to the rescue. Text © Paul Shorrock – Images © David Higgs, all rights reserved. p.s. 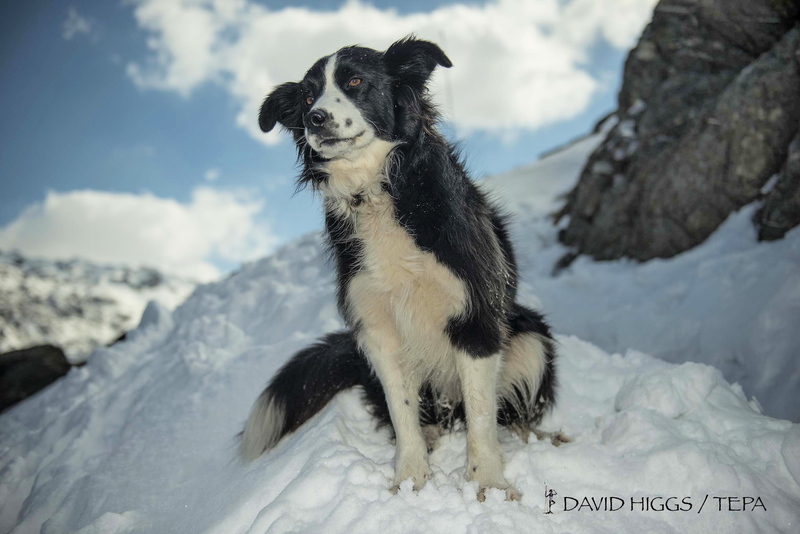 I am indebted to David Higgs for allowing me to use his fine images of the dogs working. The images may not be reproduced without his permission – should anyone wish to do so, please message me with your contact details, and I will forward the request to David. p.p.s. 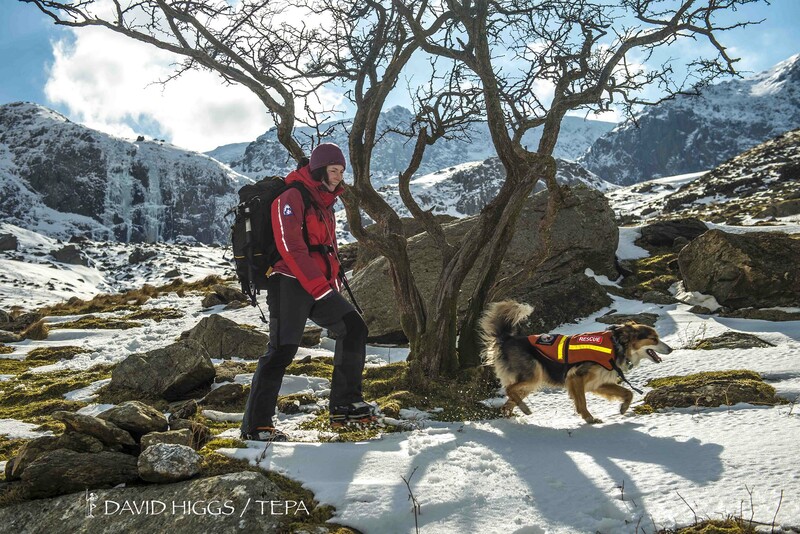 Anyone wishing to read more about the search dogs of SARDA Wales will find information on their website. You can also make a donation towards the training of these fantastic dogs – think of it as a good insurance policy. p.p.p.s On a completely different tack, as I completed this post I found the first sheep tick of the season on ‘Mist’. If you walk your dogs in sheep or deer country, it’s time to protect them against these pests – a monthly application of ‘Frontline’ does the trick. Discuss it with your vet if not sure. This entry was posted in 5. 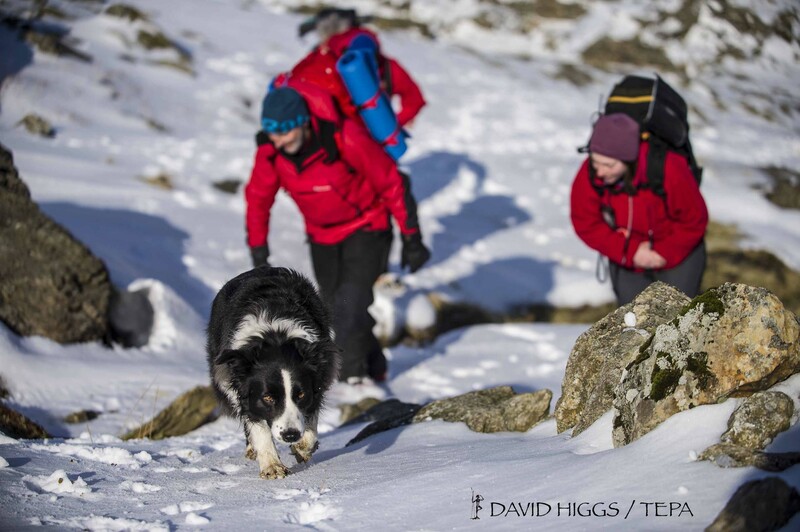 North Wales and tagged Border Collie, mountain rescue, mountaineering, mountains, photography, snow, Snowdonia, winter. Bookmark the permalink. Surprised to see that much snow on the Llanberis Pass – I’ve never seen enough to make a snowhole. But i suppose I’m not in Wales that often in winter. When was that? The pics were taken at a training session on 30 March, just a week after the blizzards that hit most of us. The snow we were on must have been weeks old, but it was easy to pick out different layers as we dug the snowhole. Cluanie is a Border Collie! They come in a range of sizes and colours, some with prick ears, some flat, some with long coats, some smooth. The breed is quite diverse, and the main thing they have in common is intelligence, temperament and desire to work – thankfully the Kennel Club haven’t diluted those characteristics (yet) by coming up with a standardised ‘pretty dog’. 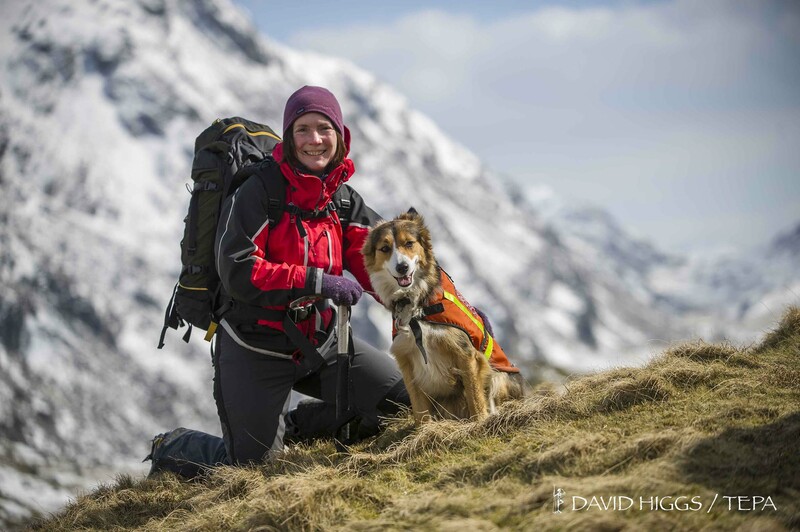 Cluanie has a sister trained as a search and rescue dog in the Lakes, and I’ve an idea that they come from a working search dog parent – there are a few breeding lines now with second or third generation search dogs. Cheers Andy – great images indeed! Looks like Mist’s taking it all in, very seriously! By the way, I’ll re-iterate your tick warning. Not all dog owners realise that dogs can pick up Lyme Disease just like us humans, so they definitely need protecting. Tilly had Lyme Disease a couple of summers ago and was very poorly. Really interesting post, and as already mentioned – those photos by David are astonishingly good. Animals, and snow, aren’t always the easiest of things to photograph. As orienteers we are super vigilant about ticks – one of our club members was in fact diagnosed with Lyme disease last year. Someone acquired their first tick of the year in Graythwaite forest recently, so they are out and about. A deer tick most likely. Last year I got a ring like rash and swelling on my arm, and when I went to the doctor made a point of mentioning the possibility of ticks and lyme disease. He had to look it up on his computer! He did thank me for bringing it to his notice though. He and another doctor reckoned mine was a spider bite, but I still got a course of antibiotics. I’ve only picked up a tick once, and I suspect it had hitched a ride on ‘Mist’ then decided that I was an easier option. excellent post Paul, and superb photos by David too. It is satisfying to know that there is professional help if it is needed! Cheers SP. I will have to get David as a regular contributor – super images! Thanks for the warning Paul et al, we have two collies so I have just ordered this year’s frontline, might even use it myself! We enjoy your blogs keep up the good work -and stay safe. It is I from the old Cath Coll, good to see someone so happy in their work, keep it up. Good to hear from you Keith – I’ll attempt to send an email to the address with your comment. Great pics! [and write up, of course! ;)]. Gutted I missed the opportunity to meet you, Chris & Misty at the Duck race over the weekend but I’m sure there will be plenty of other opportunities this summer?! Cheers Babs. Mr B had a great night on the search training – his new nickname is ‘Hawkeye’! !